We made posters to illustrate the five senses and gradually added to them as we learned about each new sense. The posters were up for Student-Led Conferences and students were asked to present and explain them to parents. I made a teacher poster and the students created their own. A bonus is that I had a parent trace the silhouettes before hand. What's missing from these examples are the 3D examples next to each sense. To each finger we glued a different texture (a cotton ball, sandpaper, foil, a button and fake fur). To the mouth we added a piece of gum, a bell hung by the ear, and we dabbed essential oil on the nose. Sight? I can't remember what we did there . . . 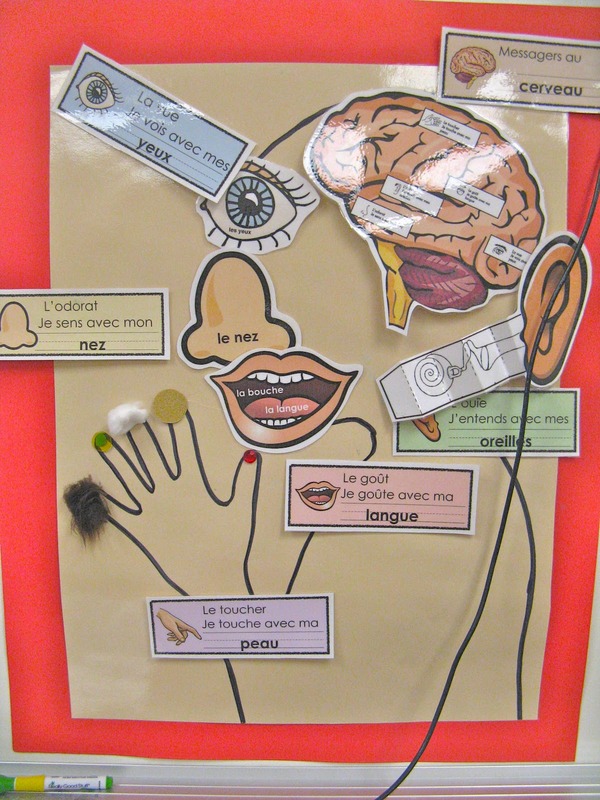 This project once again begin with labeling ("bits and pieces" or "les petits morceaux"). Our next project is about Nicki et les animaux d'hiver by Jan Brett. 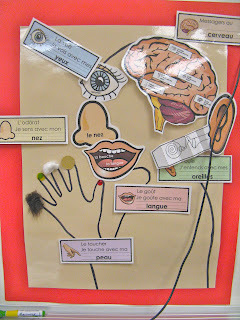 We get to revisit the "texture" vocabulary introduced in our sense of touch portion of this unit. During this unit, as students were coming into class I played a youtube song and video about the five senses. It's English but is catchy and introduces many of the concepts we plan to cover. It was an upbeat way to begin the day with some learning attached! Merci Madame! I appreciate all the comments, and the helpful corrections from readers too. I need to get to those ASAP! Bonne journée.